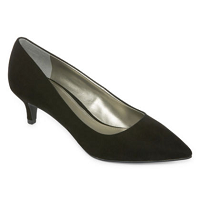 Pumps are where you can really let the personality of your wardrobe shine. The sheer variety of silhouettes, colors, and styles that JCPenney has on offer will have your head spinning with the possibilities and your feet tapping with anticipation. Update your look for autumn with a pair of sassy stilettos, fill out your professional wardrobe with classic kitten heels, and catch brunch with the girls in a casual pair of heeled sandals. No matter where your shoe-shopping journey takes you, you'll discover boutique quality at a price that will have your wallet skipping with joy. Between work, formal events, church, parties and more, it seems like there's always a need for a great pair of high heels. There's no shortage of styles either, from shiny patent pumps to understated black wedges. 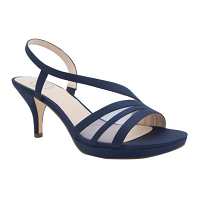 Whether you frequently find yourself at formal outings or simply need a reliable pair of high heel standards every once in a blue moon, you're bound to find the perfect pair for you thanks to JCPenney's vast selection. Okay, so the phrase may be "little black dress," but why should it take all the credit? The glamorous effect of a pair of pumps simply can't be overstated. Better yet, you'll find black heels – and brown, blue, purple and pink ones – in a variety of styles that promise to match perfectly with whichever occasion you're dressing for. Dressing for comfort? Opt for a lower heel that will keep you steady on your feet no matter what adventure the night offers. Special occasions often call for fun details like rhinestone embellishments, elaborate straps or a pretty pattern. Black pumps are practically an essential for the modern wardrobe; every woman should find a pair in the height and style she prefers so that she's always ready to show them off. There are many options beyond traditional heels and pumps. Wedges offer a bit more support for events where you'll be active and on your feet, while platforms are bold and funky – and add a couple of inches for that extra boost of confidence! Stilettos, on the other hand, are usually more delicate in nature but offer the greatest height. They're usually worn for the most formal of events, but wear them with any outfit for chic, breathtaking style. In contrast, a low-heeled silhouette gives a slightly sharper look than flats but just as much in the way of comfort. You'll find all these pumps and heels in a range of sizes from 5 to 12 and in widths spanning from narrow to extra wide. With great brands at affordable prices, you're sure to find just the right style and fit for whatever occasions come your way. 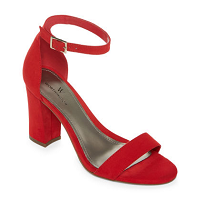 From black pumps to red Mary Janes, there are a million ways to express yourself – and not one wrong way to do it.